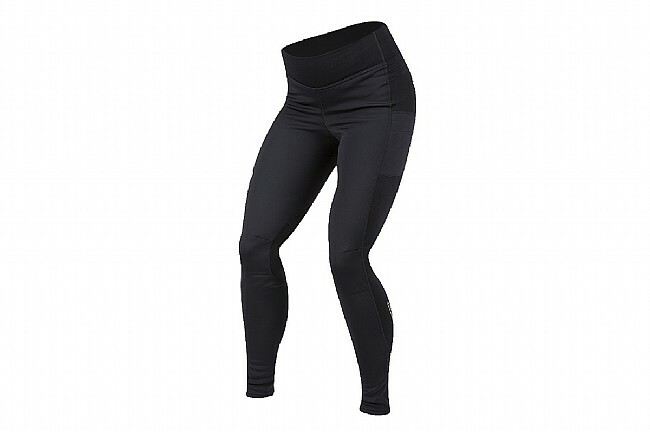 If you've got a favorite pair of bib shorts that keep you pedaling in comfort, but you need added wind and water protection for winter miles, look no further than the Pearl Izumi Women's Elite Escape AmFIB Tight. Shedding the bib straps and chamois of its siblings, this streamlined version is the perfect addition to an all-star cycling wardrobe. Constructed from a blend of wind and water repellant AmFIB™ fabric, Pearl compliments these tights with targeted Thermal Fleece™ fabric that's been treated with PI Dry™ technology to further splash and spray protection. Replacing the previous generations' ankle stirrup, the new version of the AmFIB tight chooses the more comfortable and easy-to-use ankle zipper for sealing out the elements. ELITE Softshell fabric provides superior wind and water protection. Thermal Fleece fabric with water-shedding PI Dry™ technology for all-weather performance. BioViz™ reflective elements for low-light visibility. I do not bike a ton in the winter but I run daily. I loved theee so much I came back and bought a second pair. So far they have kept me warm at feels like temps in the single digits!